The SC Division instituted a special program to honor the memory of our Confederate Ancestors and to ensure the preservation of their final resting places. Any SC Division camp member in good standing, who has demonstrated his willingness to serve in this special capacity, and has tended a Confederate soldier’s grave for two years prior, may become a FULL GUARDIAN. All compatriots are encouraged to participate in this most worthwhile program to honor our ancestors and protect their final resting places. Guardians shall care for and protect the grave of a Confederate Veteran, ensuring that the site is kept clean and well maintained year round. He shall be responsible that the grave has an appropriate marker designating it as the resting place of a Confederate Veteran. He shall personally visit the grave a minimum of three times a year, to include Confederate Memorial Day, or at least one week prior, when he shall place either a wreath or small Confederate Flag, or both, on the grave. Individuals who wish to become a GUARDIAN must complete the Guardian Application form and submit it to the Chairman of the Guardian Review Committee. There is an application fee of $10.00 to cover the cost of the GUARDIAN pin and certificate. For more information about the program and how to apply, contact our camp Graves Registration officer. 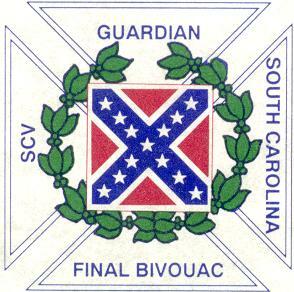 See also the SC Confederate Graves Registration project web site and the SC Division SCV Guardian Program page.